If you are a mortgage broker or lender looking to rank better in Google search reach out to me at jesse@wojdylosocialmedia.com as I have several monthly packages that will help your Internet presence. Ranking on the front page of Google search is one of the most effective marketing strategies in the financial services industry. While competitors are having to wait for leads through referrals, newspaper or billboard advertisements or having a sales force you will find that Internet traffic is more effective. 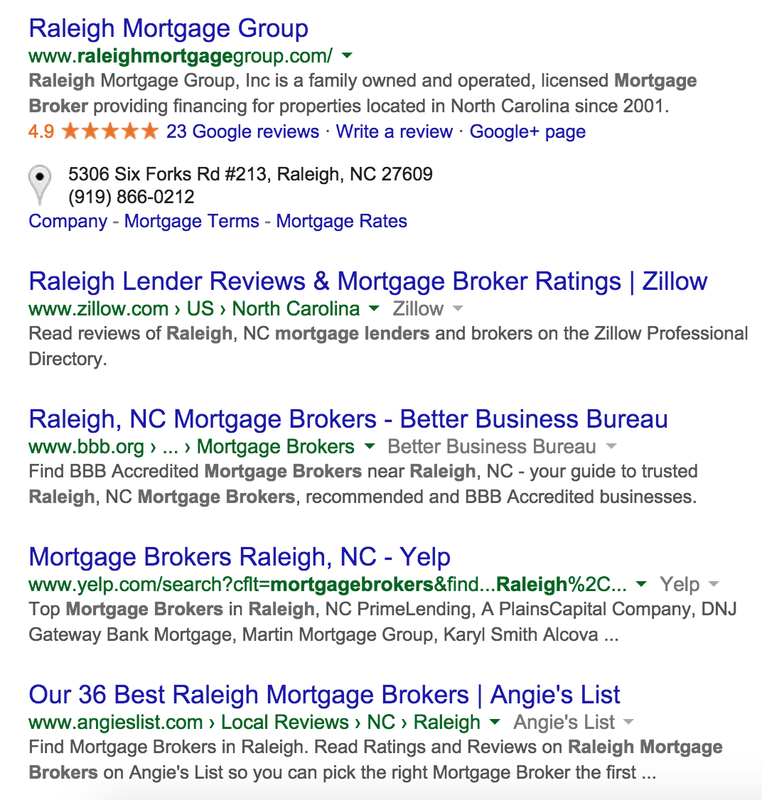 That said, ranking on the front page of Google search for “[Your City] Mortgage Broker” is not easy. In fact, it takes proper optimization and a commitment to a modern and responsive website. As a mortgage broker or lender it is important to remember that home buyers and sellers are constantly searching the Internet for services. If you rank on the front page of Google search you are going to gain exposure to someone that is ready to pick up the phone and start the transaction today. This is unlike Facebook, Twitter, LinkedIn and other social media outlets where users will notice an ad but they are not actively searching for financial services. Ranking on the front page of Google search is extremely difficult. There are few mortgage brokers that truly know how to optimize their website(s) with content to grow search traffic. Fortunately, I offer monthly packages that can help your business increase leads by ranking near, or at, the top of Google search. Through copywriting, acquiring natural links and building business partnerships you will find that ranking in Google search will provide a steady stream of potential clients and customers. Most mortgage brokers and lenders are extremely busy. They do not have time to sit down and type out blog posts on a consistent basis. They definitely do not have the time to analyze Google Analytics and determine what keywords are providing the search traffic to gain more customers. Instead of trying to learn all of this yourself it is often a wise decision to hire someone that has several years of experience with Internet Marketing and, more importantly, ranking on the front page of Google search. Getting to the top of page one for California FHA home mortgage takes time and effort but it will be well worth the investment in the long run. If a marketing firm or SEO company contacts you and you find they cannot rank their own website what makes you think they can rank your web entities? Do a little research and find out if they have been successful with their own website before handing them money to help you with your mortgage website. What Mortgage Related Keywords Are Best? This might be one of the most important aspects of SEO. You are not going to rank #1 for the keyword phrase “Mortgage Broker”. You may very well rank #1 for “Mortgage interest rates today in Raleigh, NC”. If you can rank for longer tail keywords you are going to find that your conversion rate is higher because a searcher is looking for something very specific. This means he or she will be willing to pick up the phone and learn more about your services. There are thousands of long tail keywords that can be used to optimize a mortgage broker or lender website. Common words include current, latest, most affordable, lowest, cheapest, historical, trends, etc. If you can properly create content that is focused on keywords in which you can rank on the front page you will find that search traffic increases on a consistent basis. Without new content it is extremely difficult to rank on the front page of search. If you are looking for the best mortgage related keywords feel free to contact me at jesse@wojdylosocialmedia.com. I have been publishing mortgage and housing market related content for over seven years and I am fully aware of the way in which searchers look for a mortgage broker or lender. I also do my best to come up with modern terms that you may be unaware of because of the generational gap with the younger age group now buying homes and businesses in America. How Can I Rank My WordPress Website or Blog? WordPress websites and blogs have exploded in the last several years. Most businesses have some type of blog that can be updated on a consistent basis. If you are willing to devote the time and resources to updating your blog on a daily or weekly basis you are going to find that your website ranks for more keywords. Instead of trying to do this all yourself I would strongly urge you to consider higher a copywriter or someone who knows how to write for the web. Writers do not have to have an SEO background but it helps if they understand how users will read a website or article on the Internet. Take the time to properly select a copywriter that has written content that currently ranks on the front page of Google search. Can I Rank in the Google Maps Listing? While ranking in the organic search listings of Google can drive a significant amount of traffic it also helps to get more clients from the Google Local Maps listing. Over the last few years Google has greatly changed this listing from seven (7) to three (3). There have also been changes in the way searchers see this listings. No longer is it the case that the listings are alphabetized with A, B and C. Now we are just seeing the top three local listings with the reviews under the listing. One of the best ways to improve your Google Maps local listing is to have a very strong web presence. The better your SEO the higher you will find that your Google Maps listing shows up. There are some other optimization strategies that can be used with local Google Maps listings but ultimately your overall Internet presence is what dictates your ranking. If you have the desire to rank higher in the Google Local Maps listing for mortgage related keywords email me at jesse@wojdylosocialmedia.com. We have helped a number of local mortgage brokers and lenders rank in the Maps listing while also ranking #1 in the organic part of Google search. Cost to Update a Website to 2016 Google SEO Standards | Snapchat Analytics and Public Stats Coming in 2016?